I’ve been trying to figure out how to wear these mid calf boots with pants for awhile now. Of course, they pair perfectly with a dress or skirt, but pants have been way more challenging! I ended up going with skinny boyfriends. Some slouchiness, but not too much. Wearing them with regular boyfriend jeans was a little bit of a disaster. Luckily, I didn’t make it out of the house. Overall, the silhouette is long and lean, never a bad thing — especially when you’re 5’3″. The casual vibe was perfect for a day of running around the city. And that leather ball cap is like my new favorite thing.�I’ve also been rockin’ a bold berry lip lately for some unknown reason. Always good to mix it up, I suppose. Photos shot by the lovely Emily of Sparkle Meets Pop. Love the way you made the boots work with pants- get, get it! I love this look! So casual and cute, yet a little dressy, too. And edgy! 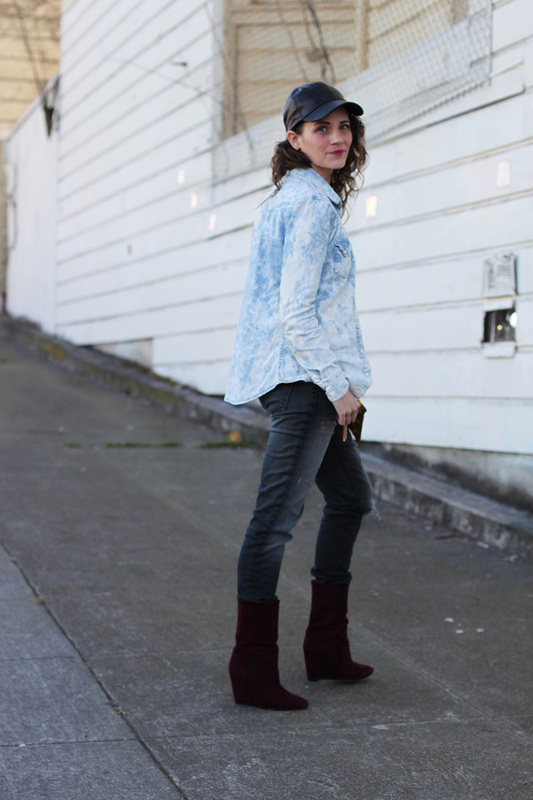 Those boots are perfection and look great with the slightly slouchy boyfriend jeans. Thanks for linking up! Such a fun and unique outfit! I love the maroon boots and the hat especially. Thanks for linking up with What She Wears, hope to see you next month! That second to last photo is incredible.